In a three-week period with the help of our Fab 5 interns we completely built the first dwelling in our poverty simulation called Lifestyles Lane. We started with the Haitian dwelling while previous interns Alexa and Cameron were here and we did make some progress on that structure while the Fab 5 were here as well, but I decided to focus on the Cambodian dwelling when the largest intern crew of the summer was here in an effort to complete it. Mission accomplished! This structure is meant to represent one household in Cambodia. It is up on stilts just like a rural house would be in that country so that ducks and other livestock can be safely housed underneath the sleeping family at night. We’ll have that too once we get closer to opening for real. We will also use the dirt we dug up for the footer on the Haitian dwelling to construct a rice paddy behind the Cambodian dwelling that the family can plant and harvest. Hammocks will hang from the rafters and there will be a small lean-to for cooking added as well. 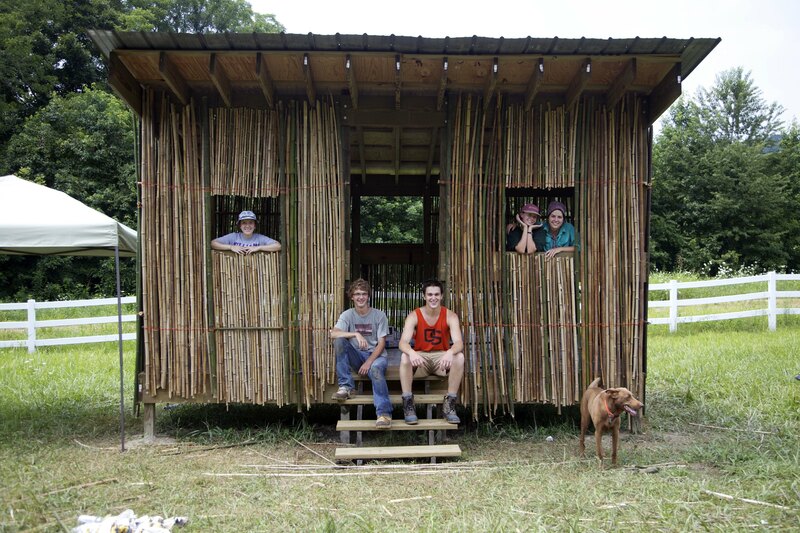 All told, the structure is 16′ long by 10′ deep for a floor area of 160 square feet. Not large, but I’ve seen houses in many developing countries smaller than this that held 8-12 people each and every night. Personal space is usually not an option in the developing world. I think it looks great. Thank you to Catherine Alvarez-McCurdy, Katie Black, Annalise Carington, Julian Cross, and Grayson Middleton for the construction and to Elden Beachy for the tin. Looks great! Kudos to all involved!